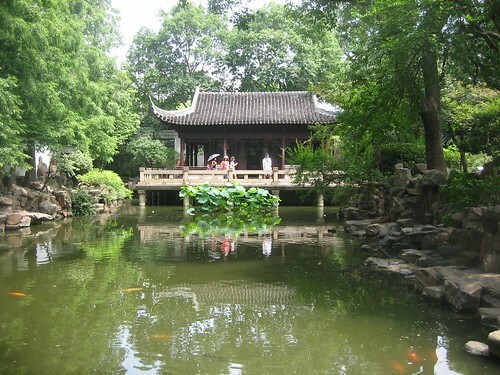 One of my favourite places I visited in Shanghai was 豫园, which inexplicably is known as Yuyuan Garden in English. Yu Yuan is really pretty and lovely, and also a huge tourist attraction filled with lots of people and surrounded by markets and restaurants. One of those restaurants is Song Yue Lou, which is located outside Exit 5 of the Yu Yuan complex. Song Yue Lou is the oldest vegetarian restaurant in Shanghai, and takes on the fairly common format of fast food downstairs and sit down ala carte upstairs. Due to circumstances, we also ended up at Song Yue Lou on two occasions (both lunches). On the first of these visits, we sat upstairs and ordered a variety of foods, including bao and noodles. Desperate for some noodles, I ordered the curry noodle soup all on my own, and C went for a curry, with bao and rice. I also had coconut juice from a can. The bao was super doughy, but the filling was good. 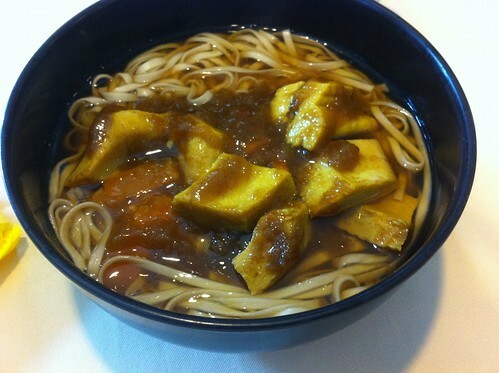 I found my noodles quite excellent, with some nice yellow wheat noodles. On the second visit we ventured upstairs but were banished downstairs with a grumble, as we only wanted to order single dishes and not a meal to share. 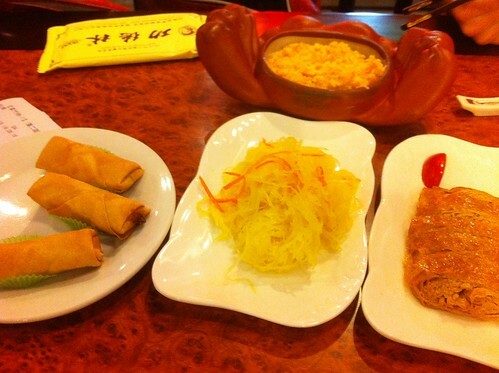 On this visit we both ordered noodles, though I fail to recall which one (the same, as it turned out, because the noodles I wanted were not available); in addition C ordered the glutinous rice dessert, which was thick and gloopy. Service downstairs is fast; service upstairs is okay but can be a little grumpy. There are stairs (and no elevator) upstairs, and a little step up into the building. Smoking is allowed, and credit card facilities are available. Get there on Line 10 (the purple line) of the Metro. I was excited to discover that there was a vegetarian restaurant in walking distance from our hotel, so the first night, tired and hungry, we went for a bit of a walk. In the end we actually dined at Godly twice. The first visit, unsure what they did well and too tired to make decisions, we went for the banquet option. The waitstaff decided to modify this for us, so we didn't go exactly for what was on the menu. We ended up with a pick-pick course, with a crab-meat dish, springrolls, mock duck made of tofu skin, and a vinegary vegetable dish. This was followed by some noodles, an onion and gai lan stir-fry thing, and some watermelon and cherry tomatoes to end it all. It was a lot of food, and it was delicious. C found that the crab meat was her favourite. All I was really focused on was the noodles, I'll admit it. On the second visit, the staff were less attentive and amiable but still good (it was very busy). We ordered a tofu and mushroom hotpot (with lots of peas), some different noodles, and a mushroom soup. The soup was super mushroomy, filled with four or five different types of mushrooms. The tofu and mushroom hotpot was also excellent, but it was at this point that we reached our mushroom limit. Service was fine, fast and easy. The menu is Chinese with English subtitles, except the tea menu, which is all in Chinese; no pictures on either menu. Some of the staff speak English. And it's pretty cheap, the banquet was about 120RMB per person and the second visit came to about 180RMB in total. Tea is about 30-60RMB a pot depending on what you get - they have a lot of tie kwan yin, which is some of my favourite. Credit card is accepted. Happy Cow says not everything is vegan there, but when I asked they said they don't use eggs or dairy in anything, so I'm not sure. Get there on lines eight, two or one of the Metro, stopping at People's Square. I was hoping to go to Trippy Taco recently, but sadly it was too full to accomodate us, even after waiting a while. So we trekked on down to Soul Food to see what we could get. 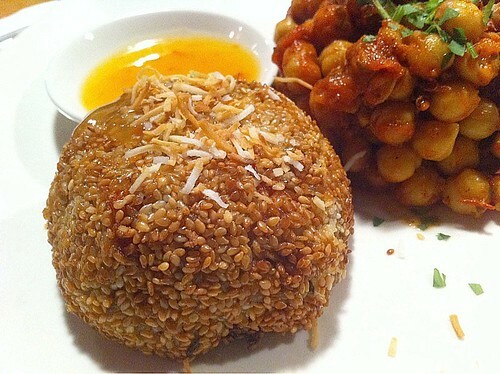 I went with the Thai rice ball with chickpea salad. The rice ball was exactly what I wanted, rice-y and a bit lentil-y, and the chickpea salad was lovely, well-cooked with a thick and tasty tomato sauce thing, but the salad was cold and I was hoping it would be warm. Disappointing! But still perfectly serviceable. accessibility: five minutes walk from the nearest tram stop. a step up to enter, but the front room is okay for maneuverability. from memory the toilet is up a flight of stairs. hello all! i actually cannot access blogger from china, but am using a free thingy that ends in two minutes! to tell you all that i can't access blogger so if your comments get stuck in moderation, it's because of that! the posts are appearing because i queued them up before i left! i thought i was clever at the time! if you want to see me check out my flickr! post again soon! 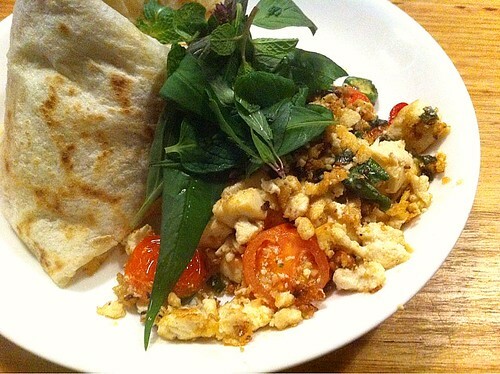 There wasn't much on the menu that was automatically vegan but the waitstaff said I could have any of the egg dishes turned vegan, so on that note I selected the sricha scramble with roti. This dish was totally serviceable, but a little bit bland. I ended up stealing some of Danni's sauce to add a little flavour. It could have done with more chilli and more of the cherry tomatoes, but I liked the roti accompaniment. danni's review (of the same day); Carla's break up with tom phat. accessibility: just near a tram stop (the 19), little step up. some easy to access tables at the front, all ordering done as table service. might be hard to head down to the toilets. 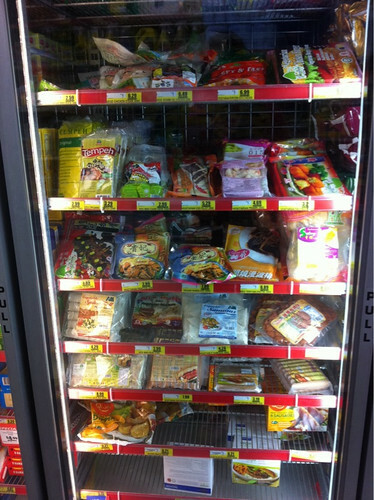 So my local IGA (located at 614 Sydney Road in Brunswick, opposite Tabet's) has recently seriously expanded its frozen mock meats range. Thanks to Lizbee for pointing this out to me one day, although returning there last night I noticed they have stuck a piece of paper to the door that says 'vegetarian meals!' to draw attention. For those vegetarians amongst you, there's a couple of varieties of Quorn down the bottom. There's also a range of vegan mock meats, including some very fishy-tasting fish, the chicken nuggets that Lord of the Fries uses, and many other exciting things! There's even cheap tempeh in there. I'm super pleased by the close proximity to my house of all this mock meat, and given my recent discovery that the range stocked by my usual supermarket is no longer vegan, I'm pleased that so much of it is vegan! More reporting on specific kinds to follow, once I try more of them. So after finally making it to brunch at Mr Nice Guy, I followed it up a week later with lunch there, too, with Ms SJ. Only option for the day was the quesadillas, which was fine as I was happy to try them out. 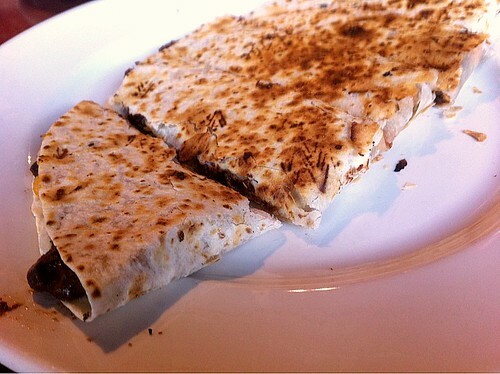 The quesadillas were toasted fresh and filled with black beans and some sort of cheeze. I liked the flavour, but they were a bit dry and definitely needed the tabasco that Lucas brought out for us. Maybe some guac or salsa would go nice as a little side? Other bloggers at brunch: Karla; Shawna. So last week it was my birthday and I decided to use it as an opportunity to finally get down to Gasometer, having heard so much about it already from every vegan and vegetarian in Melbourne. With a party of ten people on a Friday night, I booked a table. I only did this two days in advance, and there was no problem getting it. I was overwhelmed by the choice! 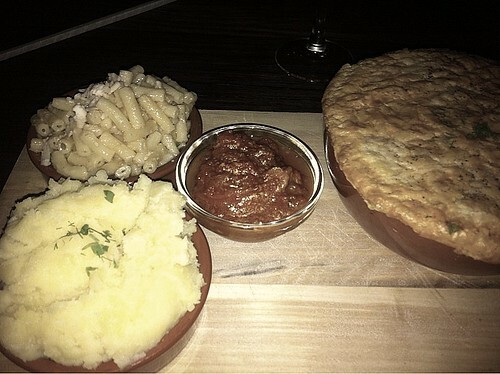 In the end I decided to go for a pot pie main, because it was cold and I had been thinking about pies. All the mains come with a choice of two sides, and because it was my birthday I picked the sides I wanted the most, carb-loaded as they were, rather than the sides I should have. I ended up going for the mac and cheeze and the potato mash. The pie came with a chutney sauce, and was filled with lots of potatoes. It was delicious, and I loved my sides, but it was massive and I couldn't come anywhere near finishing it. I would eat a main with sides again, but maybe only if I was sharing it with someone. Certainly I would eat the mac and cheeze again. I have no idea whose chicken burger this is, as three came to the table; I did sample someone's though, and it was amazing. 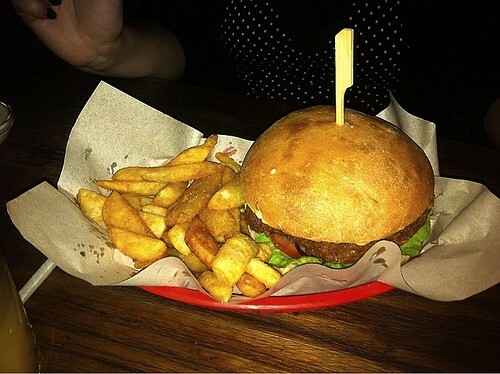 I have been thinking about this burger ever since, and I would return to Gasometer just for this burger and the chips, advertised to me by Fi as the greatest chips in Melbourne. 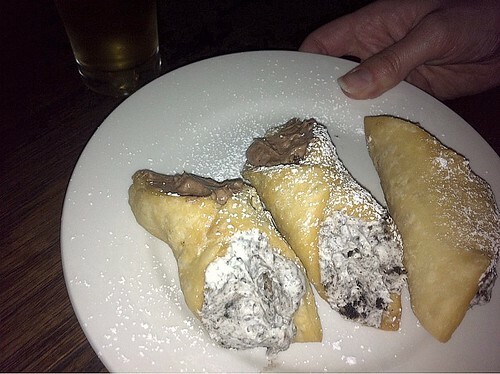 I was way too full to think about dessert, but J had thought about it and ordered the cannoli in advance. In my position as birthday penguin, J thoughtfully and very kindly (and ONLY because it was my birthday) let me have one. These were chocolate on one side and cookies and cream on the other and MY WORD. MY WORD. I had thought that cannoli was a delight to which I could never return, now that I am vegan, but oh these were very excellent cannoli. I recommend so highly. They were delicious. Nobody else who came has blogged! SADFACE. I know Erin had the tofu wings and they were pretty good, and J had the mac and cheeze as a meal but would not repeat the experience. Others who have eaten there: Carla; Danni; K + Toby; Veg in the West (once + twice); and Cindy and Michael (one, two, three, four times). Handily accessible on the 86 tram, cramped and too warm on a friday night, difficult to navigate if you have mobility issues and way too noisy. Cindy and Michael rated the tables as 'spaced wide apart' so maybe they're different on different nights? I am going to Shanghai next week, and Hong Kong the week after, and I am starting to get really excited about it! So now I am looking for recommendations for food and things in those two places. In HK I'm staying on Kowloon (in Kowloon? ), and in Shanghai I'm staying in a fancy boutique hotel right next to People's Square. Have you been to either of these places? Do you have anything to recommend? Also, has anyone purchased the Happy Cow iPhone app? I am considering it but I have such a mixed relationship with Happy Cow I'm just not sure! Advise me, internets! After many an aborted attempt, I finally made it down to the Mr Nice Guy cafe for their brunch. Danni, Emilly and I headed in there for brunch one Sunday afternoon about 1pm (it's still brunch if you haven't had breakfast or lunch yet, right?). Danni went for the apple crepes, which she has already blogged about. This was actually my favourite of the brunch dishes! The options for the crepes are nutella or baked apple, and the baked apple came with walnuts and it was delicious, just the right size and a lovely flavour. I totally want this all to myself next time I am there for brunch. 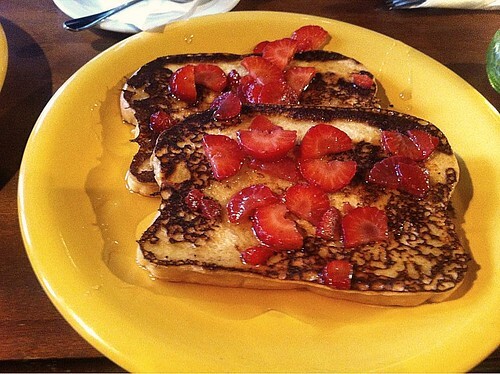 I went for the french toast, because I have a love and that love is french toast. Sadly, it was not up to Monk Bodhi Dharma levels of french toast but it was still pretty tasty! I recommend it to all. 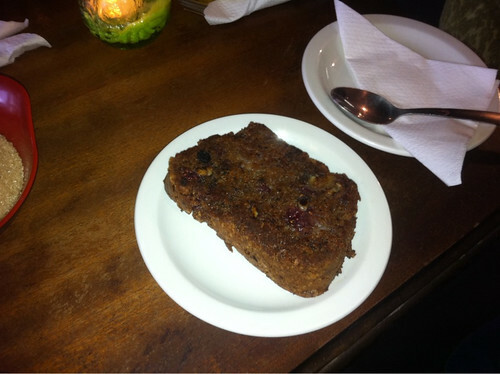 Emilly went for the banana and berry bread! (I think it was banana and berry) It was very tasty too! It was kind of more cakey than bready but I would totally eat it all for myself! Other reviews: Where's The Beef; Words at Random. Accessibility: wide doors and no steps, close to the train station. May be some trouble navigating it after 8pm when entry is only via the Noise Bar.